It’s New Year 2017! Have you made a resolution to support a cause this year? Here’s your chance to strike off this plan from your to-do list. You can help Akshaya Patra feed a child for a year! 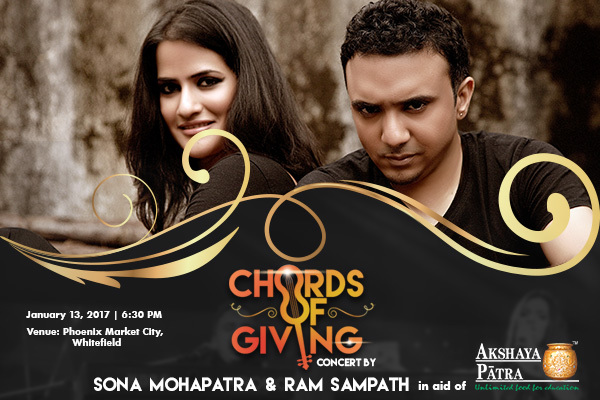 In only a few days, Akshaya Patra will be hosting a musical fiesta called the Chords of Giving at Phoenix Marketcity in Bengaluru and the concert will feature renowned Bollywood duo, Sona Mohapatra and Ram Sampath. Sona Mohapatra is a celebrated singer and performer while Ram Sampath is a music composer, producer and musician. Together, they have delivered breathtaking and successful soundtracks in Indian music. On January 13th, they will perform for a noble cause and as always, they will take the audience on an enticing musical journey through different genres of Indian music. Come, be a part of this musical journey which will ultimately help children across India access education and wholesome food through Akshaya Patra’s support. The proceeds from this concert will go towards Akshaya Patra and each ticket purchased will feed a child for a year.